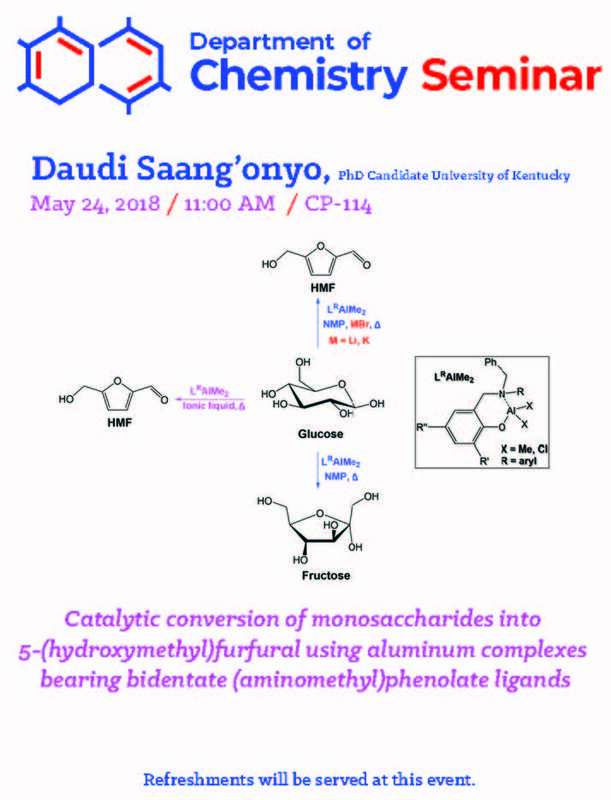 Daudi Saang'onyo will present his exit seminar: Catalytic conversion of monosaccharides into 5-(hydroxymethyl)furfural using aluminum complexes bearing bidentate (aminomethyl)phenolate ligands. Currently, the major sources of fuel, energy, and chemicals are nonrenewable fossil resources such as petroleum, natural gas, and coal. Additionally, petroleum is used for the production of most transportation fuels and for the production of about 95% of organic chemicals. However, the production and use of non-renewable fossil fuels are unsustainable. For economic and environmental sustainability, there is a need to search for new and/or renewable resources and technologies for energy, fuels, and chemicals production that have the potential of effectively substituting fossil resources. In this context, lignocellulosic biomass is one of the candidates that meet these requirements due to its abundance and renewability. 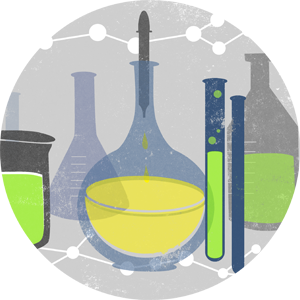 Lignocellulosic biomass-derived sugars can be chemically converted into 5-(hydroxymethyl)furfural (HMF), a versatile platform chemical that can used to generate intermediates for the production of biofuels and chemicals. In this exit seminar, novel aluminum catalytic systems developed for converting monosaccharides into HMF will be discussed. The catalytic activity of dimethyl aluminum complexes bearing (aminomethyl)phenolate ligands in converting glucose into HMF in ionic liquids is explored. A systematic study on the effects of modification of the aluminum ancillary ligands on the efficiency of glucose conversion is presented. The HMF yield was dependent of both the solvent and the aluminum catalyst used. High HMF yield was achieved by using catalysts with aryl substituents on the amino groups and/or presence of sterically encumbered substituents on the phenolate moiety of the (aminomethyl)phenolate ligands. Conversion of glucose to HMF occurs through isomerization of glucose to fructose, followed by fructose dehydration to HMF. Results from this work deomnstrated that the selectivity for HMF production from glucose was determined by the selectivity of the fructose dehydration step. The isomerization of glucose to fructose using aluminum catalysts in N-methyl-2-pyrrolidone (NMP) is discussed. Using isotopic labeling and NMR spectroscopy a proposed mechanism for the isomerization of glucose to fructose is presented.